A great melting pot (labeled as such) occupied the middle of the stage. A long column of immigrant students descended into the pot from backstage, clad in outlandish garb and flaunting signs proclaiming their fatherlands. Simultaneously from either side of the pot another stream of men emerged, each prosperously dressed in identical suits of clothes and each carrying a little American flag. Immigrants, the poor and the hopeful would come to the United States. There, they would assimilate to the American Way of Life. People of different cultures, languages and nationalities would all work in Ford’s factory in the same ways, to earn the same pay (the $5 day), and, in the end, to have the choice of buying a motor car in ‘any colour you like as long as it’s black’, to quote Henry’s famous expression. Mass production presupposed mass consumption and mass culture. It was based on a philosophy of cultural uniformity, both in the realm of work and the realm of consumption, the realm of necessity where one earned a wage and the realm of market freedom where one bought a car. ‘It is necessary to establish something in the way of a routine and to make most motions purely repetitive’, said Ford. Only the barely minimal was expected of workers. Moreover, it was the same minimal, over and over again: not much physical capacity and not much intellectual capacity. Not only were the units of input minimal; they were homogeneous. The most basic element of the uniformity was work discipline. Ford’s view was that ‘anyone who does not like to work in our way may always leave’. This was a choice that actually meant no choice. By reducing the requirements of work to the minimal, they were also made uniform. Work is life. Economics is culture. Styles of production depend on styles of consumption. The culture of work established by the Fordist production line became not just the culture of 9 to 5 or 7 to 4, but the culture of everyday life. This new order, rather proudly, was called ‘industrial society’. Its hopes and aspirations were called ‘mass culture’. Its material affluence was manifest in mass consumption. Work was but one aspect of a more generalised frame of cultural uniformity — the society of the melting pot. So what made this social system work? Why did more people willingly do jobs that involved progressively less skill and less responsibility? The answer lies in part in the division of culture from work. There was one world, the world of work, governed by linear commands and the relentless rolling on of the production line. Then there was another world in which you had a car and took the family on picnics in the countryside on days off. Culture—self-actualisation, self-expression, active meaning making—was something that for most people could only happen in spaces they made for themselves outside of work. As an immigrant to industrial modernity, for example, culture in the sense of folk life could be maintained in leisure time: songs and dances and types of food. Different cultural inclinations actualised in this space might be attributed to ‘ethnicity’ or ‘tradition’. Work was the realm of necessity, the world of uniformity. Culture was the realm for freedom, a world where there could be diversity. And necessity was a precondition to freedom. Waged work was the means to material sustenance without which there could be no culture. You needed a wage to buy the ingredients to actualise the cultures of food or to buy the gramophone and the records to listen to the songs of your choice. People endured the realm of necessity because there was a realm of freedom, the working week because there was the weekend, the factory or the office because there was the family, labour because there was leisure, public toil because there was a private life. There were growing efficiencies in Fordist work only because it was a socially viable production system, and this was because the space for leisure was growing. The apparently inexorable deskilling and reduced control over one’s life and work was only acceptable because there was the promise that the realm of freedom was both richer and more extensive: richer for the ever-increasing range of mass-produced consumer goods and the freedom to do with these things what one would; and more extensive for the reductions in the length of the working week. Culture, as much as it is conceived as a separate realm by Fordist industrialism, was not unaffected by work, however. In fact, Fordist work involved a number of border crossings. The first was into industrialism itself. People’s lives were forever changed from the moment they started working for money on the production line and buying the goods produced by industrial society. This was, despite Fordism’s disavowal of culture, a cultural crossover. The second border crossing overlapped with the first, but happened constantly, not just at one moment but all the time once people had moved into industrialism. This was the influence of work on the culture of everyday life. Mass production creates mass culture. And mass culture creates cultural homogeneity. This was a unidirectional influence of work on culture, necessity making cultural impositions on what was formally the realm of freedom. So while it was formally possible to do whatever you wanted in the realm of freedom according to your cultural inclinations, it was still any colour you liked so long as it was black. The mass culture that came with Fordist forms of production celebrated cultural uniformity. This might have been manifest in the standardised products it was assumed everyone would want. Or the straight up and down buildings of the modern city, the little boxes that all looked just the same whether stacked vertically or horizontally. Or the great moral and ideological pressure put on immigrants to assimilate in the interests of forging singular nationhood. There was just one American Way of Life, or one Australian Way of Life, or whatever way of life it was that other modern nationalist states styled for themselves. The third border crossing was classical imperialism. Entrepreneurial multinationalism involved territorial conquest. Long before Fordism, in the first moments of industrialisation and the emergence of the factory system, the East India Company needed Britain to own India. So Britain took India into its Empire. Kaiser Steel saw its interests served by extending the borders of the German nation-state. The great American motor manufacturers saw the need for Central American rubber, so the Americans took over Nicaragua. This literal border crossing was integrally related to the rise of nationally based monopolies and great corporations. Far from leaving culture alone, work in Fordist industrialism transformed culture at every moment in which one of these three borders was crossed. The cultural change was variously called the melting pot, development, assimilation, progress, modernity. The assured self-image of industrialism written through these images was one that assumed this was a cultural one-way street. Indeed, these border crossings—because you were really only expected to cross over one way, because they all involved cultural imposition more than they did cultural dialogue—were all imperialisms of sorts. In the same way that all the individuals in the Fordist organisation were supposed to personify the manager, the citizens inhabiting the realm of cultural freedom were expected to conform to the self-image of homogeneous national culture. Human movement on a massive scale has been going on for centuries. Diversity is by no means a recent phenomenon, even if the scale of movement is now unprecedented and the issue of diversity is more important than ever. Indigenous peoples have had their settled existences irreversibly disrupted by colonial conquerors. Immigrants have moved from the ends of the earth to start a new life in the old colonial metropolises. The world’s languages are just one piece of evidence of this history. Just three hundred years ago, say, ten or twelve generations, English was spoken by several million members of one small tribe who lived in the south-eastern part of an island off Europe. Now there are probably a billion speakers of English as a first or second or third language. And how many languages are spoken in England [today]? Diversity, in other words, is no recent business. The ways in which diversity is handled, however, have changed radically and they are still changing. 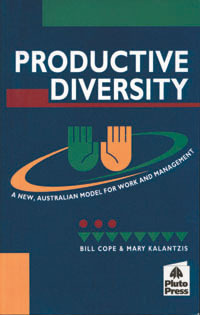 The way diversity was managed on the Fordist production line fitted in with a broader social idealism called assimilation. ‘Nation’ was the main idea used to create cultural uniformity in the era of Fordism. Modern society would eventually make us all the same as we accepted the benefits of progress, development and civilisation. We could all assimilate to the culture of ‘nation’. Those others, the immigrants and the indigenous peoples, were, after all, by the standards of modernity, decidedly inferior—recent peasants or hunter-gatherers who could only benefit by joining the society of mass production and mass culture. In this task, modern enterprises served up homogeneous products for people whose needs and wants were all assumed to be the same. Mass consumption of mass-produced products would bring us all into modern culture. Enterprises would produce ‘modern man’ in the singular, with identical goals and aspirations, each with his (and it was ‘his’) station on a production line. At best, cultural backgrounds were used, cynically, until such time as people assimilated, as a divide and rule strategy that served the interests of the organisation. It was only natural, then, that the modern state should demand a single ‘national’ affinity. This state wanted us all to pretend that we were kith and kin, or at least that our children, who knew no other traditions by direct experience, would. This was a world of work and a world of cultural experience which assumed the nation was inexorably moving towards one culture, the culture of industrial work, mass consumption and the unitary nation-state. Difference was something to be erased in the cultural melting pot. Out of this melting pot would come the alloy of cultural and linguistic homogeneity, the modern unified nation-state. Schools taught children to identify with the nation as one culture. Every day, children sang the national anthem, and learnt the simplified historical narratives of nation. When they grew up, loyalty was crucial. Wars would have to be waged on the basis of identification to one, culturally homogeneous nation.